"I can see in his eyes when he runs he really wants to do well for his country. I really wish him well in his retirement." - Usain Bolt, speaking at a track meet in Japan (where he was the VIP guest) about Japanese sprinter Nobuharu Asahara, who retired at the age of 36 after anchoring Japan to its first Olympic men's track medal in 80 years. Thanks to Bolt, Asahara and the entire Japanese 4 x 100m, the meet was a huge success as 25,000 fans showed up. 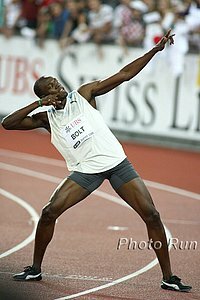 The meet is just the latest stop on the Usain Bolt World Tour. In the last few days, he's been spotted in St. Lucia, Jamaica, Japan and now on to the US for David Letterman Thursday night. *Ruthless Charles van Commenee To Take Control Of UK Athletics The Belgian isn't afraid to call a spade a spade and many think he's just what UK needs if they are to improve their performances at home in 2012. LRC: Nick Willis, Lisa Dobriskey Win Thrilling Continental Airlines Fifth Avenue Mile Titles Lisa D. outkicked Shannon Rowbury on the women's side in a close race. On the men's side, Nick Willis outleaned Bernard Lagat to cap a great season with his first win of note. LetsRun.com was an hand.